Southwest monsoon has further advanced into remaining parts of central Arabian Sea, some more parts of Maharashtra and some parts of Gujarat region. The Northern Limit of Monsoon passes through Lat. 20°N/ Long. 60°E, Lat. 20°N/ Long. 65°E, Lat. 20°N/ Long. 70°E, Valsad, Malegaon, Amravati, Gondia, Titlagarh, Cuttack, Midnapore, Lat. 24°N/ Long. 89°E, Goalpara, Baghdogra and Lat. 27°N/ Long. 87°E. 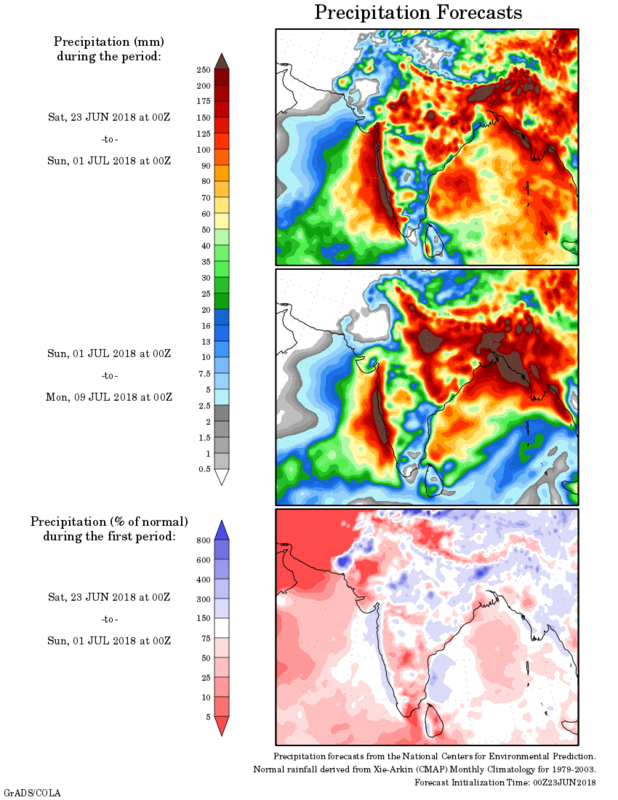 Conditions are favourable for further advance of Southwest Monsoon over some parts of north Arabian Sea, remaining parts of Maharashtra & Assam; some more parts of Gujarat region, Chhattisgarh, Odisha, West Bengal; some parts of south Saurashtra, Jharkhand, Bihar and Madhya Pradesh during next 2­-3 days. Conditions are becoming favourable for pre­monsoon thunderstorm activity over parts of northwest India from 27 June onwards. નોંધ: રેગ્યુલર અપડેટ 25 તારીખે છે. વાતાવરણ 22 જૂન થી સુધારો જોવા મળેલ છે. ચોમાસુ આજે 23 જૂન દક્ષિણ ગુજરાત માં વલસાડ સુધી પહોંચ્યું. હવે 2-3 દિવસ માં દક્ષિણ ગુજરાત ના વધુ ભાગો અને દક્ષિણ સૌરાષ્ટ્ર માં ચોમાસુ આગળ ચાલશે. જે વિસ્તાર માં ચોમાસુ ના પહોંચ્યું હોય ત્યાં છૂટ છવાયા ઝાપટા/વરસાદ ચાલુ રહેશે. જ્યાં ચોમાસુ પહોંચ્યું હોય ત્યાં વરસાદ વિસ્તાર અને માત્રા વધુ હોય. The is an Off-shore Monsoon trough at sea level now runs along South Gujarat to Kerala Coast. There is a UAC at 700 hPa over Maharashtra and adjoining areas. mean sea level and tilt southwards with height. Scattered showers/rain to continue over Saurashtra, Gujarat & Kutch till onset of Southwest Monsoon. Areas where the Monsoon has onset the rain coverage and quantum will be higher.